A Talk With The Founder of Wealth Watchers! Thanks to Twitter, and other sources online, I’ve been lucky to meet, at least in cyberspace, a lot of great people in the personal finance field. One of those people is author and business founder Alice Wood. Long story – short, after a freak accident in an airplane left her with a brain injury, Alice had trouble making good decisions about some things, including her finances. It eventually led her to create “Wealth Watchers”. Wealth Watchers encourages a group format for support, and a tracking system so you know where every dollar goes. Sounds like another ‘Watchers” group doesn’t it? And that was the point. Please check out Alice’s website listed in our links on the right side of the page. It is a great resource for students and parents. The first chapter of Alice’s book is printed on her site and is a very interesting read as well. I asked Alice if she would like to give some tips to my readers and she graciously accepted. In part one today, I asked Alice her thoughts on the need for students to get into the habit of saving their money at an early stage. Then Alice touched on a subject which, I think, rings true throughout our society these days whether your children are getting ready for college or not. What's the right age to begin the (money) conversation? As soon as they can spend money or encourage their parents to spend money. One of the greatest things we can tell our children is "No"..."It's not in our budget"..."Put it on your list." - If parents can teach their children (and themselves) to delay gratification they will be setting their kids up for success when it comes to money and school. I’ll have another post with Alice Wood later this week. Meanwhile, please check out her website for Wealth Watchers. See you soon. Cheers! Just a quick post to re-post a comment left on this blog in relation to an article I wrote about Scholarships. This comment came from Pam Whitlock and is a great tip as seniors continue the push for scholarship money. "My oldest child is a senior this year so we are right in the middle of college and scholarship applications. We were at a seminar last weekend and heard some practical advice. The admissions person said that it is okay to use the same essays and cover letters for different applications but to always (always) make sure you have changed the name of the school in all areas of the essay or letter. He has gotten many letters where the student has mentioned the wrong college or changed it on the first line but not within the body of the letter itself. Proofread, proofread, proofread!" Thanks to Pam for this comment and tip. I read every comment left here so if you have any tips or tricks to help make Money Smart Students, by all means leave it here, or on our Facebook Fan page. Huge Tuition Cut for Ontario Students! Are you kidding me? Is it really true - the news coming out of Toronto yesterday? Politicians living up to their election campaign promises? It is true! And it is some unbelievably great news for post-secondary students in the Province of Ontario. The Liberal Government of Dalton McGuinty - which controls tuition fees at colleges and universities - has cut tuition fees by 30% effective January 1st 2012! That's right - 30%! Fulltime students with family incomes less than $160,000 are eligible for the tuition cut - which will save University students about $1600 a year and college students around $730. The move will cost the government $200 million in income and there's no word yet on how they'll make that up. However, less expensive education means more students can get the training they want and need to begin good careers - making them taxpayers, and consumers, and eventually homeowners, etc. It might be short-term pain for the government with the lost revenue, but it will definitely be long-term gain in a lot of ways. There's also the issue that many types of students who could use a tuition break - such as retraining workers - are left out of this announcement. Let's hope, however, that the government comes up with another plan to help out those students in the very near future. It's a step in the right direction in the area of tuition fees. Let's lobby more jurisdictions throughout North America to follow Ontario's lead and give college and university students the breaks they deserve! One of the things I really like about being online, is that as the Money Smart Student Community grows I am coming across more and more fantastic resources to pass on. I've found another one! The website is http://www.moneytrail.net/ and it is a money management site for teens and their families. Parents and teens can track things like allowances, IOU's and expenses. The best part about it is - it's FREE! I encourage you to check it out and see if it might be of use in your family. I have a feeling it will! As the Money Smart Student family continues to grow and gain momentum, I'd like to invite our new readers to join our Facebook page. It will be an easy way to find out when there are new postings on the website, as well as a source of new and different information on it's own. Click on the link below to go to our Facebook page and please 'Like' us. Thank you for your continuing support everyone. I am really looking forward to the next few months. Cheers! 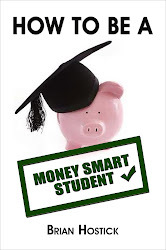 Money Smart Students Facebook Page - Click Here! I wanted to introduce you to a great resource I found recently thanks to Twitter. It's called 'College Financial Aid Advisors'. The young lady behind the company is Jodi Okun. Jodi is a wealth of information for students AND parents when it comes to sources of financial aid, maximizing your amount eligibility, and other college money information. I invite all of you to check out Jodi's website and take a look at the services she offers and the information she has available. You never know what money saving, or money getting, tips you'll find. Jodi is also the moderator of the weekly Twitter chat #collegecash, every Thursday night at 10 pm Eastern. You can join Jodi (@JodiOkun) and others, including yours truly (@monysmartstdnts), as we discuss a different subject each week related to college life and college finances. There are some really great people involved in this chat and a lot of great information is exchanged - so I hope we'll see you there.